I wish I brunched more often. But my dining out is more dinner-focused, with brunch just an occasional indulgence. For me, weekend mornings are perfect for lying around in PJ’s. What if you could stay in your PJ’s, sip mimosas, and partake in dreamy Spanish cuisine? Sounds good, right? Check out the just-launched Pajama Brunch at Ballston’s SER. I recently sampled offerings from the new brunch, and had a real awakening. 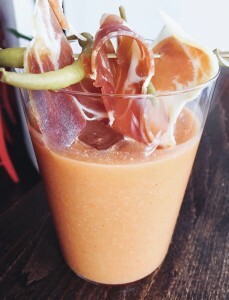 Is there a better way to start a Sunday than imbibing in an Andalucian Bloody Mary blending gazpacho and vodka, and garnished with thinly sliced jamon? I don’t think so. Come to SER hungry. The three course pajama menu is $32. 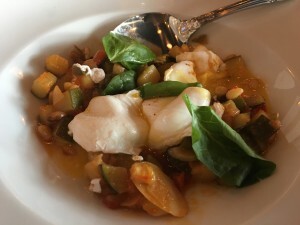 First course offerings include pisto manchego- a savory stew of vegetables, raisins, pine nuts, and poached egg. Or, start your feast with sauteed vegetables paired with smoked halibut or salmon. Second course offerings include eggs with Spanish fries and your choice of a protein including chorizo, blood sausage, shrimp, or smoked salmon. There’s also a catch of the day or a chicken roulade to rouse you out of a sleepy state. 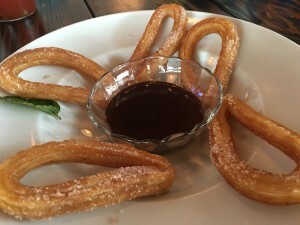 Churros con chocolate is one of several luscious options to sweeten the meal. If three courses is too much to handle in the am, there are plenty of alternatives. I love Chef Josu Zubikarai’s paella at SER, and happily it’s on the brunch menu. You can also opt for a more traditional breakfast and partake in waffles or tortilla de patatas (potato and egg). Explore the full brunch menu at SER here. But don’t miss out. This brunch really is a dream come true.